Unlike all the other planets, Uranus and its rings are tilted by almost a right angle. One exciting detail we studied that is very relevant to the question of extraterrestrial life is the fate of an atmosphere after a giant impact. Our high resolution simulations reveal that some of the atmosphere that survives the initial collision can still be removed by the subsequent violent bulging of the planet. The lack of an atmosphere makes a planet a lot less likely to host life. Then again, perhaps the massive energy input and added material might help create useful chemicals for life as well. Rocky material from the impacting body’s core can also get mixed into the outer atmosphere. 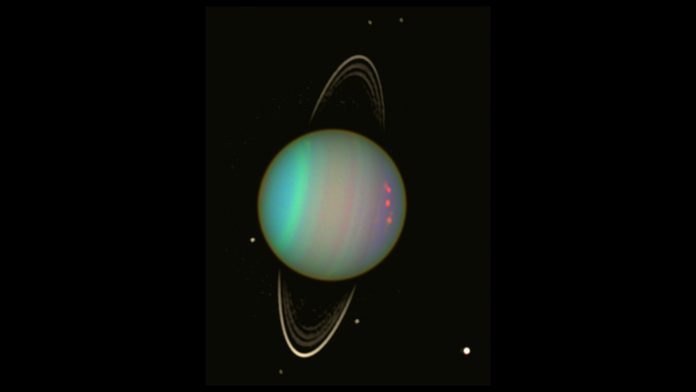 This means we can look for certain trace elements which might be indicators of similar impacts if we observe them in an exoplanet’s atmosphere.Lots of questions remain about Uranus, and giant impacts in general. Even though our simulations are getting more detailed, we still have lots to learn. Many people are therefore calling for a new mission to Uranus and Neptune to study their strange magnetic fields, their quirky families of moons and rings and even simply what precisely they’re actually made of. The Author of this article Jacob Kegerreis is a PhD student of Computational Astronomy at the Durham university.